The device location frequency can be set by the user. 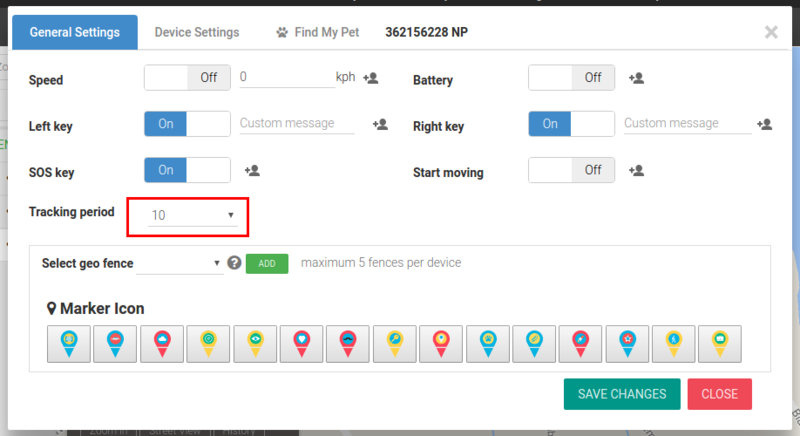 This setting determines how often the device reports its location to you through the Trackimo system. Manual The device location will only update when the user clicks the update location button; this ensures the longest battery life to the device. 1 Minute The device will update its location every 1 minute; this mode will cause the device to have the shortest battery life. 5 Minutes The device will update its location every 5 minutes; this mode will cause the device to have a short battery life. 30 Minutes The device will update its location every 30 minutes; this mode will cause the device to have a moderate battery life. 120 Minutes The device will update its location every 120 minutes; this mode will cause the device to have a long battery life. Note: When the device reaches a low battery alarm, it automatically switches to manual mode to conserve the device battery.